The Brother MFC-9840CDW multi-function printer is Brother’s response to the Brother MFC critics and looks to address and improve on its shortcomings as a color-laser multi-function printer. Armed with multiple duplex printing, scanning, copying, faxing capabilities and wireless printing capabilities, the Brother MFC-9840CDW looks to silence doubts surrounding Brother’s color laser printers while catering to the multiple office needs of customers at home or in the workplace. The MFC-9840CDW continues the reputable quality of its predecessor in printing speed and quality, with a speed of 21 pages per minute in printing both color and monochrome prints. Its print resolution is still at 2400 x 600 dots per inch. The initial upgrade is done on the machine’s networking capabilities, which now includes the 802.11 b/g wireless interface, while maintaining its Ethernet and USB 2.0 interfaces. Standard memory is at 128MB, a nice boost from the MFC-9440CN, which has a 64MB memory. The memory can also be upgraded to 640MB, which suits the MFC-9840CDW nicely with the wireless networking capability. Driver compatibility supports Windows and MAC operating systems, and PCL-6 and BR-Script 3 through emulation. High volume capacity is still enjoyed with the MFC-9840CDW, with a 250-sheet input paper tray capacity, including a 50-sheet multi-purpose tray. High speed fax is at 33.6K bps for both color and monochrome types, clocking at approximately 2 seconds per page, the same as its predecessor. Autodial and broadcast locations are upgraded, with up to 340 locations for autodialing capability and up to 390 locations for broadcasting. Fax page memory is up to 500, and a nice addition for the MFC-9840CDW is duplex faxing. Copy function now features a 50-page automatic document feeder, a 15-page upgrade from the standard 35. 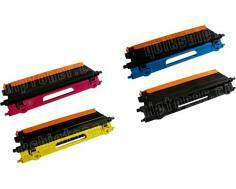 The Brother MFC-9840CDW still yields a decent 17-page per minute speed, both for monochrome and color. Unlike its predecessor which has been criticized for its copy quality, the Brother MFC-9840CDW boasts significant improvement in this area. Reduction and enlargement options remain the same, from 25-400%. As with its faxing function, a copy duplex capability is added to the MFC-9840CDW. 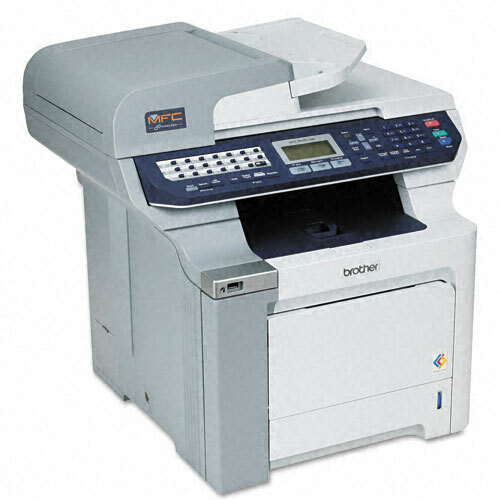 The MFC-9840CDW also functions as a stand-alone copier. Scanning with the MFC-9840CDW also improved, with duplex scanning added and with a maximum scan resolution of 19,200 dpi. Optical scan resolution is set at a maximum of 1200 x 2400 dpi. Input color scan bit depth is still at 48-bit, while the “scan to” feature added email server to its direct scan destinations. The MFC-9840CDW power consumption is also impressive, garnering an Energy Star mark, making the multi-function printer energy efficient at 510 watts when copying. With dimensions of 20.9" x 21" x 20.5" and weight of 83.2 lbs, the MFC-9840CDW comes as a heavy multi-function printer. As with the MFC-9840CDW’s wireless networking, set up continues to be a challenge, and the scanner software lacks advanced options for advanced scanning needs. The MFC-9840CDW has no improvements to address noise production, as it still registers at 54 decibels, same with the MFC-9440CN. The design is also somewhat cumbersome, as it can be quite difficult to remove letter sized paper, without any space provided to easily do the task. Another caveat is its LCD menu display panel remains in monochrome, with a confusing menu navigation pad. And while the toner cartridges yield a decent number of printed pages, overall all consumable prices for the MFC-9840CDW is at around 22 cents, comparably higher to other printer consumable costs of the same class. Review it: "Brother MFC-9840CDW "
The MFC-9840CDW includes a monochrome standard yield toner cartridge, for 2,500 pages and 1,500 pages each for its color toner cartridges. Drum unit yields 17,000 pages before needing a replacement. 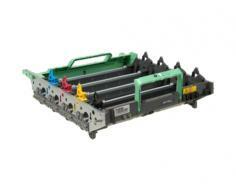 Replacements for toner cartridges and drum unit, albeit MFC-9840CDW’s hefty size is easily done. Maintaining its high volume printing and faxing capability, the MFC-9840CDW has a maximum monthly duty cycle of 35,000 pages, while recommended monthly print volume is around 500 to 3,000 pages, quite durable for a wireless multi-function laser printer with duplex functions.